Each solar cell, by themselves, don’t typically produce that much electricity. So, what you need to do is wire them into a solar panel, which can then be connected into an array! First, however, we need a little bit of electricity theory. If solar cells are connected in a series configuration, the voltages of each solar panel add up, and the current stays the same. So, with this understanding it is a good idea to match all the solar panels for the same amount of current, because if too much current is sent through a solar cell, it has the opportunity to blow up a trace (small cracks in the metal the electricity travels on), or more damage can occur. The following diagram illustrates similar solar cells attached in both the series and the parallel configuration, with resultant outputs below at the terminals. Pay close attention to the +/- terminals of the solar cells, the different configurations changes the way they are connected together. 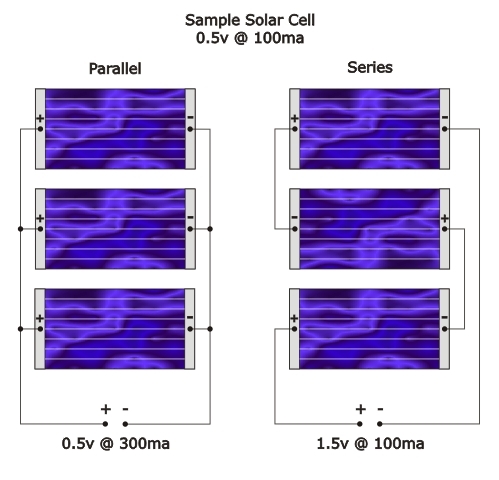 Connecting solar cells in parallel offers the opportunity to increase the amperage output, while keeping the voltage output the same, assuming the voltages of the solar cells are matched. The above diagram illustrates what you could expect. 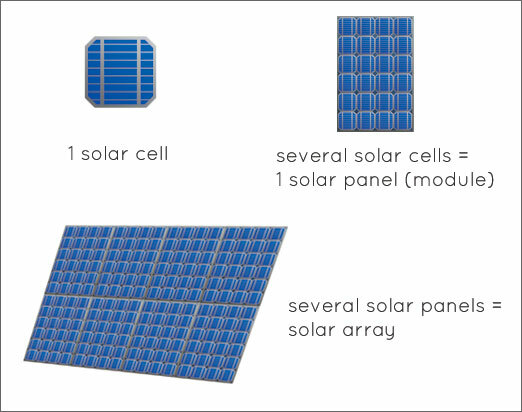 Pay close attention to the +/- terminals of the solar cells, the different configurations changes the way they are connected together. It is highly suggested to connect similarly matched (same specs) solar cells. If this isn’t done, the output requires a little bit more in-depth calculations, and there can also be complications and wear on the electrical circuit (heat loss creates stress), since there will not be an even distribution of power and electron flow. Make things easy on the circuit and connect matched (the same specs) solar panels or cells. Double or triple check how the terminals of each solar cell or panel have been connected. Connecting them wrong will most likely still allow them to work (at severely decreased efficiency) and cause unnecessary wear on the circuit. When connecting the cells together, it is wise to try and keep the wires between them the same length. Each wire has resistance (albeit very low) which will change the characteristics of the circuit slightly. Do some simple calculations before you buy the supplies for your new solar panel array. Knowing approximate specs of the circuit will allow you to select the right size of wires, connectors, diodes, and fuses for the circuit, paying special attention to amperage ratings. It is ideal to arrange all the solar panels in the same plane/surface so that they all receive the same amount of sunlight all the time. Failing to do this will severely decrease the efficiency of the solar cell array. Failed panels in a solar circuit will cause a problem and decrease your output. Test your circuit frequently for quality, and replace the solar cells that aren’t producing an output.